Marklin 37418 Swedish State Railways SJ class Rc 3 from Marklin. Swedish State Railways (SJ) class Rc 3. Version in an orange basic paint scheme with white stripes and the newer SJ logo of the Seventies. Red double-arm pantographs, older design snowplow. The locomotive looks as it did around 1975. This is the 37418 Swedish State Railways SJ class Rc 3 from Marklin. Swedish State Railways (SJ) class Rc 3. Version in an orange basic paint scheme with white stripes and the newer SJ logo of the Seventies. Red double-arm pantographs, older design snowplow. The locomotive looks as it did around 1975. Model: The locomotive has an mfx digital decoder and extensive sound functions. It also has controlled high-efficiency propulsion. 2 axles powered. Traction tires. The four-light headlights change over with the direction of travel, will work in conventional operation, and can be controlled digitally. Length over the buffers 18.0 cm / 7-1/8". 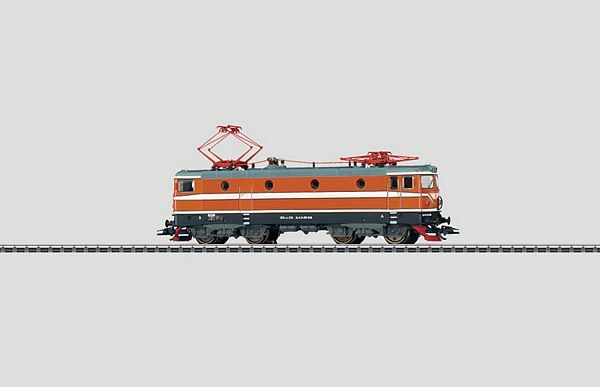 A passenger car set to go with this electric locomotive can be found under item no. 43785.